The Tennessee Housing Development Agency (THDA) is offering $15,000 in down payment assistance to Great Choice-eligible homebuyers who purchase a home in targeted neighborhoods across the state that were hard hit by the downturn and have been slower to recover, through the Hardest Hit Fund Down Payment Assistance (HHF-DPA) program. Homebuyers will make no monthly payments on the second mortgage loan during its 10 year term, and it does not accrue any interest. In addition, THDA will forgive 20 percent of the second mortgage loan each year starting in year six. Therefore, if a homeowner does not refinance, sell or move out of their home by the end of the tenth year, the second mortgage loan would be completely forgiven. THDA received approval from the U.S. Department of Treasury to commit $60 million in federal funding to its new HHF Down Payment Assistance Program. The source of this funding is U.S. Treasury’s Hardest Hit Fund (HHF). 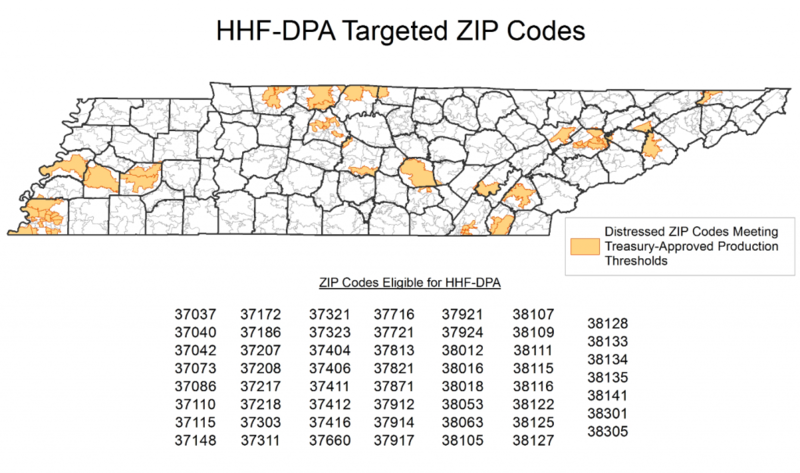 THDA’s $15,000 HHF Down Payment Assistance program is available in targeted ZIP Codes based on a number of “stress” factors, including foreclosures, short sales, and negative equity rates. THDA offers the Great Choice Plus down payment assistance to Great Choice-eligible homebuyers who take advantage of the Great Choice Home Loan program outside of these targeted ZIP Codes. However, the Great Choice Plus down payment assistance is limited to five percent of the home’s purchase price and is not completely forgiven for 30 years.